Welcome to the home page of Adirondack Snowmobile. Adirondack Snowmobile has been providing guided tours through the lakes, fields and trails of the Adirondack park for over thirty years. Owner, Gary Bishop, is an experienced guide and will offer you the best possible snowmobile adventure in the area. Please call 518-523-4360 if you have any questions and/or for reservations. Also check us out at facebook, just look up Adirondack Snowmobile for more great pictures and info!! Join us for one of our tours and see why we love what we do!! Unguided Rentals and custom packages are also available. Please call for rates. 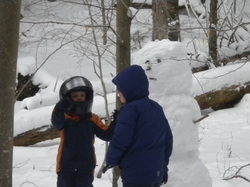 Adirondack Snowmobile Rental offers fun for the whole family. Our rental snowmobiles are full sized, late model sleds with comfort, performance and safety built in mind. Our single seater models are 550 CC Super Sports. Doubles seater models are 550 Trail Touring. All models feature electric start and reverse, as well as hand warmers and comfortable back rests. Ride locations: Rides are offered on a combination of wooded trails and semi-open meadows. The 75-90 minute guided tour covers approximately 15 to 18 miles on groomed New York State Snowmobile Association trails. 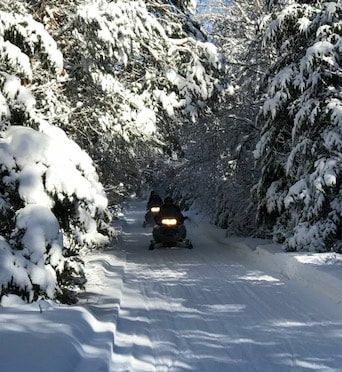 4 hour guided tours or options to ride alone are also available as seen in the above picture of a satisfied Adirondack Snowmobile Rental customer.